Each year, seniors and their families lose billions of dollars to con artists. A new investigation by Consumer Reports, the world’s largest and most trusted nonprofit consumer organization, takes an in-depth look at how elderly victims across the nation have fallen for scams committed by strangers that have cost them tens and even hundreds of thousands of dollars, and, in some cases, have resulted in the loss of their entire life savings. To help consumers protect themselves, their loved ones and their assets against this type of fraud, Consumer Reports has outlined important steps to build a safety net to help prevent financial loss. 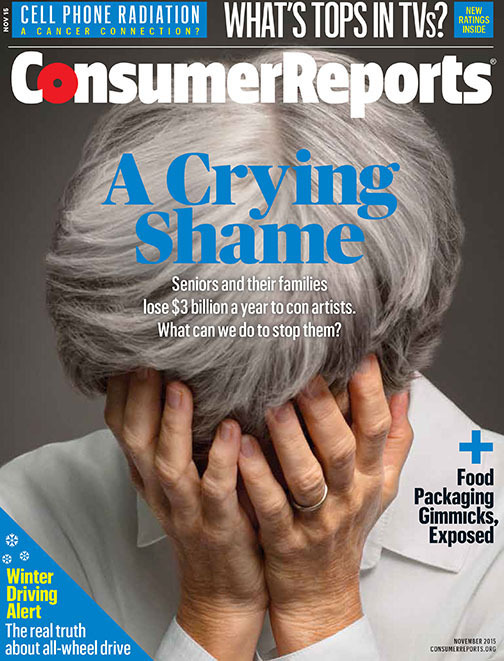 “Lies, Secrets, and Scams” is featured on ConsumerReports.org and in the November issue of Consumer Reports magazine. This 10-page feature highlights first-hand accounts from eight victims and their family members, breaks down the anatomy of a swindle, and provides information on how to prevent scams, where to report crimes, and more. Scammers use seniors’ isolation to their advantage. Most of the scams that victims told Consumer Reports about were initiated through a phone call. Staying involved in the community – and getting out and about – is key in preventing elder financial abuse. Stop robocalls. Sign up for Nomorobo, a free service available to costumers with VoIP service with select providers. Consider a whitelist call blocker device, which blocks numbers that are not programmed into it. And, if someone from an unknown number calls, don’t press to connect to a representative, just hang up; responding shows that a live person is there and that may generate more calls. Also, sign up for the National Do Not Call Registry (donotcall.gov or 888-382-1222); it won’t prevent crooks from calling, but it will limit legitimate marketing calls. Have someone help pay the bills. Create a shared bank account with a trusted friend or family member. Arrange to transfer only enough money each month to pay the bills. Get to know the officers and tellers at the local bank or credit union; they may raise a flag if they notice suspicious activity on an account. Arrange for limited account oversight. Some financial institutions will send statements and alerts to a trusted person who has no direct access to a senior’s account but can check for suspected fraud. EverSafe is a paid, Web-based service that consolidates all accounts in one place and checks for suspicious activity daily. Someone else can receive the online statements without having access to the accounts that are being monitored. Vet all contractors and financial advisors’ credentials. For contractors, check with the state licensing board and the local Better Business Bureau. Ask for proof of insurance and bonding. Don’t pay in full upfront. For financial advisors, check brokercheck.finra.org to find regulatory actions, violations, or complaints. Set up an emergency plan. Temporary hospitalization or permanent incapacity are just two reasons someone may not be able to control his or her own finances. Give power of attorney to someone trusted and financially secure. The power-of-attorney document can be drawn up with limits, such as assigning a relative or friend to monitor the person with power of attorney; mandating a periodic written report of financial transactions; or assigning joint powers of attorney, which requires two signatures on every check. For more on senior scams and how to avoid becoming a victim, visit ConsumerReports.org. Consumers can follow the conversation on Twitter at #StopSeniorScams.